Marilyn Darling AC visiting the NGA to launch Painting Country. 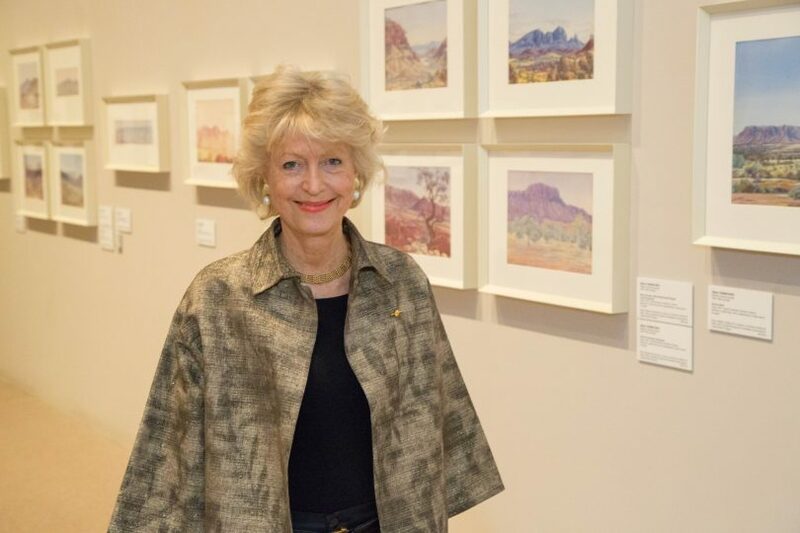 Over the last 30 years, Australian philanthropists Gordon and Marilyn Darling gathered together a stunning collection of watercolours by Western Arrarnta artist Albert Namatjira. Now these works, a major gift generously donated to the NGA, are on display to the public for the very first time. Gordon and Marilyn Darling were entranced by Namatjira’s paintings of his Country’s ancient landscape with its eerie ghost gums. The majority of the NGA’s collection of Namatjira’s artworks were gifted from the Darlings’ private collection. A recent bequest from Gordon Darling established a fund to support the research and future acquisition of works on paper by Hermannsburg artists, who continue to be inspired by Namatjira’s work. Namatjira’s vivid landscapes track the path of one of the oldest waterways in the world, the Finke River, as it carves its way from Central Australia’s eucalypt-strewn Ormiston Gorge to the edges of the Simpson Desert. Painting Country also includes an extraordinary collection of paintings and brightly coloured terracotta pots by Namatjira’s family and admirers. A touching testament to the Darlings and one of Australia’s most iconic artists, Painting Country deserves a spot in every art-lover’s cultural calendar. While at the NGA, visitors can add to their experience of Aboriginal and Torres Strait Islander art with a trip to Defying Empire: 3rd National Indigenous Art Triennial.